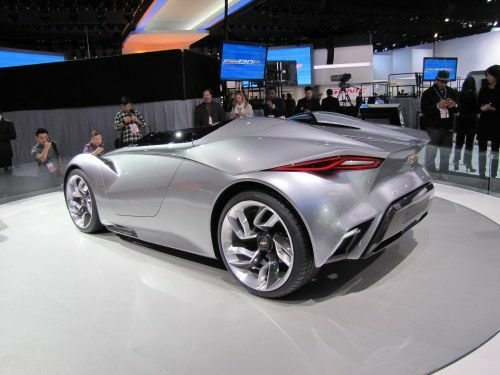 GM Korea first unveiled the Chevrolet Miray (pronounced Me-ray) concept at the 2011 Seoul Motor Show. It is now on display at the NAIAS 2012 in Detroit. Think mid-electric hybrid-powered sports model here. The Miray, which means 'future' in Korean, was created to celebrate Chevrolet's centennial anniversary which took place in 2011. The 'future' design is present with both the exterior and in the interior with its center console-mounted start button, ambient lighting and dual-cockpit design for both the driver and passenger area. This was my first in-person view of the Miray; and I must say the car is stunning with regard to the aesthetics. The design has already been noted to take some cues from Chevrolet’s heritage, and was inspired by earlier models such as the 1963 Monza SS and the 1962 Corvair Super Spyder. There's a split grille for the front fascia and sharp lines over the smooth and slightly rounded surfaces of the car's design. I especially liked the styling around the wheels which gives the appearance of separate from the main body. I also liked the rear design which holds your eye with the unique tail lamps. Also, the side panels get a sharp feature line along its length with a light-pipe feature. The body also makes use of carbon panels such as for the spoilers. The Miray is also fitted with 20 inch wheels at the front and 21-inchers at the rear. According to Chevrolet, he concept's powertrain consists of two front-mounted electric motors, each producing 15 kW (20 bhp / 20 PS) of power for the front axle, coupled with a 1.5 liter four-cylinder turbocharged petrol unit mounted mid-rear which drives the back wheels. Current for the electric motors comes from a 1.6 kWh lithium-ion battery pack that is recharged through regenerative braking. The propulsion arrangement kind of says a lot about the future: Cars will likely be both IC engine and electric propulsion, at least in the immediate. Note the use of electric for the front wheels and the ICE for the rear wheels. Enough said, enjoy the photo gallery as well as my video of the display during both Press Preview days.